Human stem cells are considered a major new hope in the field of medicine. In the future, it is expected that they will make it possible to treat a wide range of ailments such as neurodegenerative diseases. 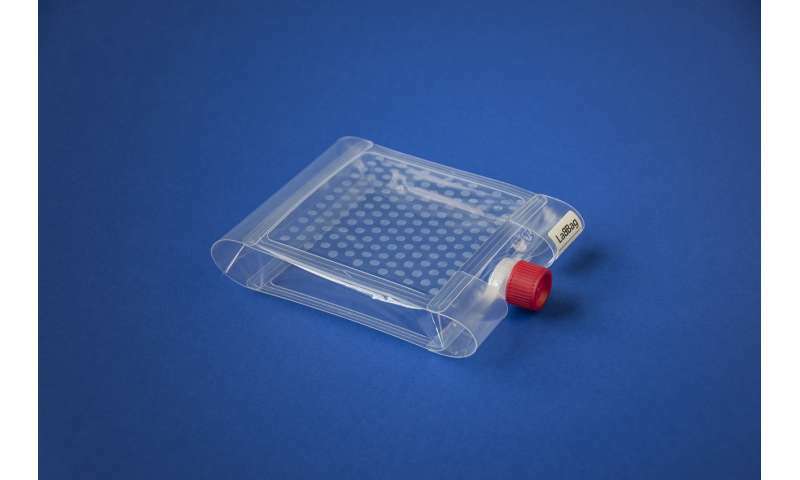 With LabBag, Fraunhofer researchers have developed an all-in-one system in the form of a transparent bag that provides a cheap, fast and sterile way for scientists to grow, differentiate and freeze stem cells. The cell models produced can be used for toxicity tests and drug development. Having successfully tested the system, researchers will present a prototype at the MEDICA trade fair in Düsseldorf, Germany, from November 13 to 16. Scientists worldwide are looking for ways to heal diseases using stem cells. These cells offer the potential to develop new types of therapies and drugs. Stem cell material also holds the key to researching diseases in a way that was not possible before. If researchers are to achieve meaningful and transferable results, there must be an increase in the cell material to be examined. In addition, the latest studies show that 3-D cell models reflect the conditions in the human body much more accurately. The generation of these cell aggregates takes place primarily under sterile conditions in droplet-shaped nutrient solutions. In the future, it will be possible to complete this process cheaply and reliably. As part of the LabBag project, the Fraunhofer Institute for Biomedical Engineering IBMT, the Fraunhofer Institute for Surface Engineering and Thin Films IST, and the Fraunhofer Institute for Process Engineering and Packaging IVV have pooled their expertise to develop a miniature laboratory in the form of a plastic bag. Inside this bag, human induced pluripotent stem cells (see box) – in other words, artificially produced stem cells – are able both to grow and to form 3-D aggregates in a sterile environment. These cells can be used by the pharmaceutical industry as patient- or disease-specific test systems for drug development and research into active ingredients. Until now, stem cell aggregates have been generated by using pipette feeder robots (which are expensive to purchase and maintain) or by means of manual pipetting (which is labor- and time-intensive). Manual pipetting in petri dishes requires a lot of practice, and there is also the risk of contamination. The "laboratory in a bag" developed by Fraunhofer researchers aims to reduce the costs of labor and materials while also significantly increasing cell yield and process reliability. Simply by shaking the transparent bag, it takes just a few seconds to produce several hundred hanging droplets of nutrient solution, virtually automatically. 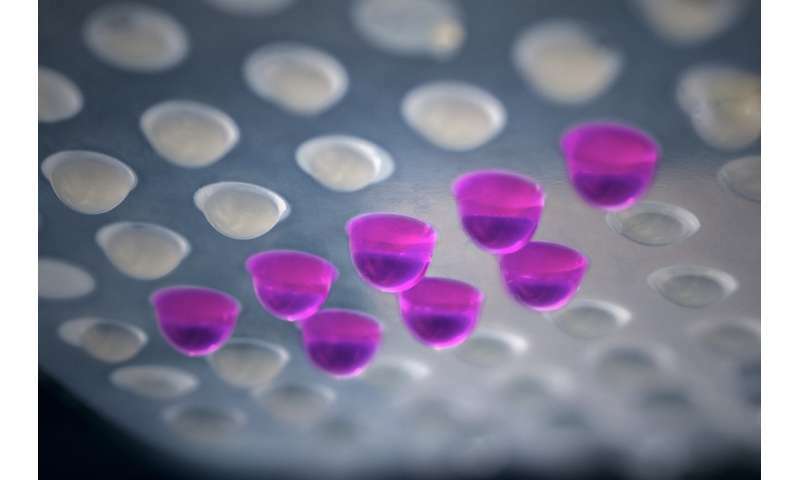 The droplets function as mini-bioreactors in which cell aggregates are able to form. First of all, the nutrient solution containing the stem cells is poured into the bag. The bag is rotated once and then returned to its initial position. During this process, the droplets remain suspended on round hydrophilic spots. The cells sink to the bottom of the droplets, where they bind together and fuse to form a defined 3-D aggregate. "We have coated the polymer film of the bag with two different coatings," explains Dr. Michael Thomas, project manager and scientist at Fraunhofer IST, whose team is responsible for the coating of the polymer film. "A hydrophobic, water-repellent base layer ensures that the nutrient solution containing proteins flows over the surface and doesn't stick to it. However, the second layer consists of 150 hydrophilic round spots, each with a diameter of 5 millimeters. The solution gets 'caught' on these spots, thus creating the droplets." To functionalize the surface of the film in such a specific way, the Braunschweig researchers make use of atmospheric pressure plasma processes. In this method, physical plasma is generated in a gas gap between two electrodes by applying alternating voltage. This plasma is then used to treat the surfaces of a wide variety of materials. One of the outstanding feature of LabBag is that the resulting cell models can even be frozen in the bag. Unlike with manual pipetting, there is no longer any need to transfer material into a separate cryogenic vessel. How to optimize cryopreservation – that is, the freezing of cells – falls within the remit of Fraunhofer IBMT. In addition, this institute has responsibility within the project for growing stem cells as well as for characterizing and analyzing the 3-D aggregates. "We are focusing on growing induced pluripotent stem cells (iPS), since these have the potential to develop into any cell in the body as well as into any tissue or specific type of tissue. Unlike embryonic stem cells, they don't provoke any ethical controversies either," says Dr. Julia Neubauer, biologist at Fraunhofer IBMT. Stem cells become specialized in their shape and capabilities so as to accomplish certain tasks, and this makes it possible to develop patient-specific drugs. Dr. Neubauer and her colleagues are focusing on the differentiation into heart muscle cells, and have actually already differentiated iPS cells into cells of this type successfully. Every drop has a volume of approximately 20 microliters, and the size of the 3-D cell model is around 400 micrometers. By varying the diameter of the spot on the surface of the bag, the size of the aggregates can be adjusted so as to achieve a targeted expansion of the biological portfolio. At present, Dr. Neubauer and her team need roughly 72 hours to produce aggregates in hanging droplets. "We describe our LabBag as a mini GMP laboratory – where 'GMP' is short for 'good manufacturing practice,' for which it meets all the requirements. The closed, sterile nature of the system makes the risk of contamination very small. Ultimately, we can produce better cell models for drug research and thereby avoid experiments on animals," Dr. Neubauer stresses. The team plans to integrate sensors for controlling the process. Fraunhofer IVV in Freising and its branch lab in Dresden were responsible for creating the bag. They took charge of the choice and development of the materials used, including the seal, as well as of designing the bag and its underlying technology. "We conducted a lot of tests relating to issues such as permeability, the quality of microscopic analysis, biocompatibility, and resistance to temperature and chemicals. After all that, we decided on polymer films. Previously we had identified 15 groups of polymers, and we examined eight of these," says Dr. Cornelia Stramm, scientist at Fraunhofer IVV in Freising. Andrea Liebmann, from Fraunhofer IVV in Dresden, adds, "The list of requirements for the LabBag was very demanding. It needed to be highly transparent and adequately retain its shape; it had to be sealable and stackable; it needed to be capable of being sterilized and undergoing cryogenic freezing. The bag also had to offer single-handed operation (self-opening) and good accessibility for the exchange of nutrient solutions. To satisfy these high requirements, we developed a partially automated test rig to produce the bags." Since it is cost-efficient to make the LabBag, it represents an attractive alternative to traditional approaches. A prototype of this patent-pending disposable bag will be presented November 13-16 at the joint Fraunhofer booth at the MEDICA trade fair in Düsseldorf (Hall 10, Booth G05/H04). The mini GMP laboratory offers the pharmaceutical industry – and also smaller laboratories with no clean room technology – the opportunity to grow high-quality cell models for drug research without incurring high investment costs.